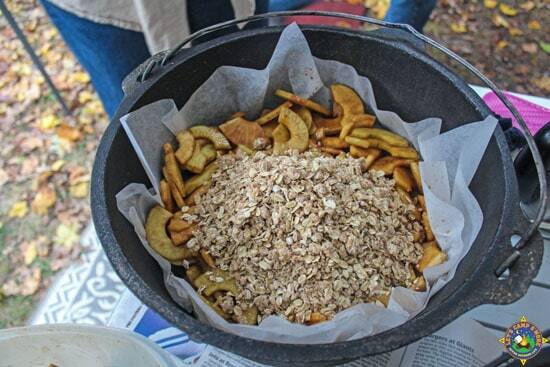 Enjoy this Apple Crumble recipe made in the Dutch oven from Mod Squad member, Peggy S.
Last month we attended a fall camping rally and our friends, Peggy and Paul were there. 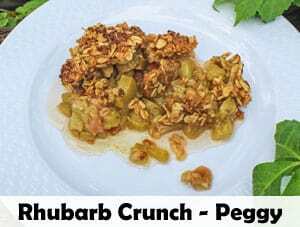 Peggy submitted her Rhubarb Crunch Recipe to be featured back in the spring and now she has another great Dutch oven dessert. 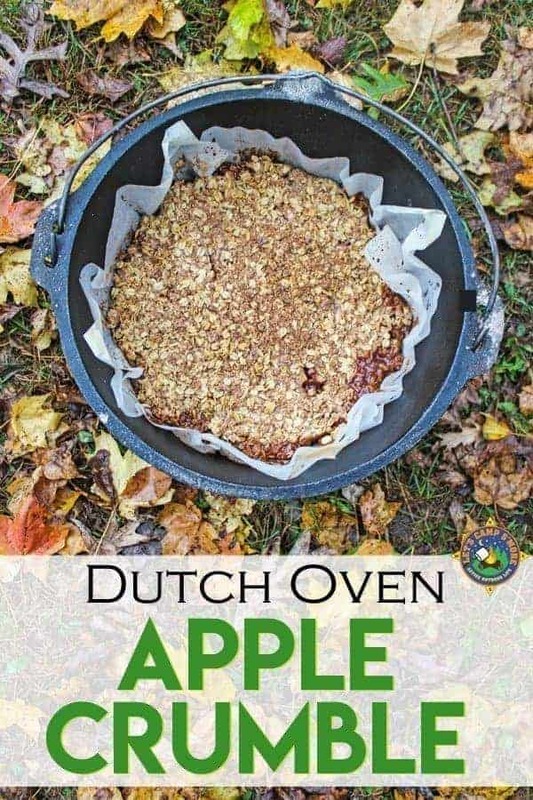 Enjoy her version of Dutch Oven Apple Crumble which she adapted from the King Arthur Flour Cookbook. Before prepping, start charcoal briquettes in a charcoal chimney. You’ll need 8 for the bottom and 16 for the top, but add a few extra for backup. 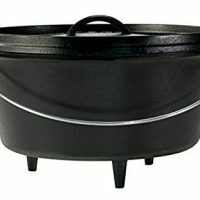 Preheat your Dutch oven over the fire. Line it with parchment paper. 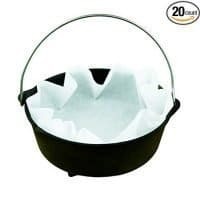 Check out these homemade Dutch oven liners. Peel and slice the apples. I used an apple peeler/corer/slicer device to speed up the process. Mix the sliced apples with the rest of apple mixture ingredients in a large bowl, stirring gently to keep apples from breaking. The topping can be made ahead and kept chilled until ready to use. I did this before the camping trip. Store in a covered container or a plastic zipper storage bag. In a food processor or with a pastry blender (which is easier while camping), cut flour and butter pieces together until crumbly. Add the rest of ingredients except for the oats. When all the ingredients are combined evenly, stir in the oats. Place apple mixture into the dutch oven and top with the crumbly mixture. You can sprinkle with some chopped nuts if desired. We use a foil baking pan that is the size of the bottom of the Dutch oven to contain the coals. Place the 8 coals in an even circular pattern and put the Dutch oven on top. 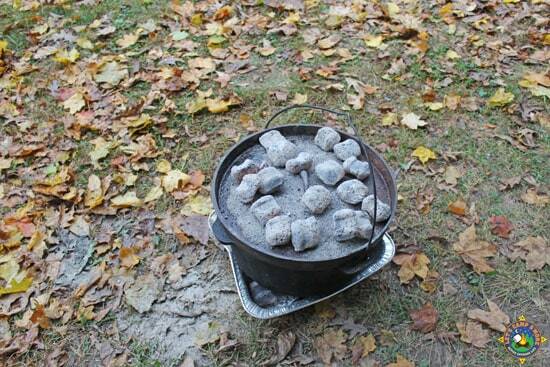 Place lid on Dutch oven and put 16 coals on top around rim and middle of the lid. Allow 40- 45 minutes to bake. Rotate lid after 15 minutes one direction and Dutch oven, the other direction. Do this again in 15 more minutes. Check to see if bubbly and brown. You can leave it a few more minutes, but realize that the crumble will keep baking in a hot Dutch oven. Take the Dutch oven off of the bottom coals if getting too done on the bottom. Allow it to sit for at least 10 minutes with no coals. The more you open the Dutch oven, the longer it takes to bake. Doesn’t this Apple Crumble look fantastic? I was amazing! 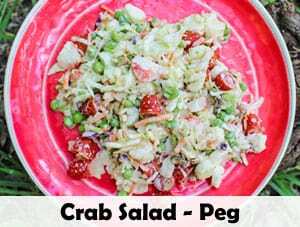 Thank you to Peggy for sharing this recipe with us. 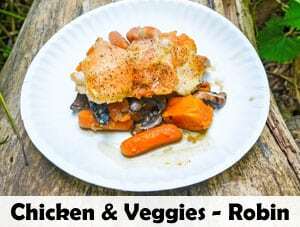 She’s a fantastic cook and we are looking forward to featuring more recipes from her again. 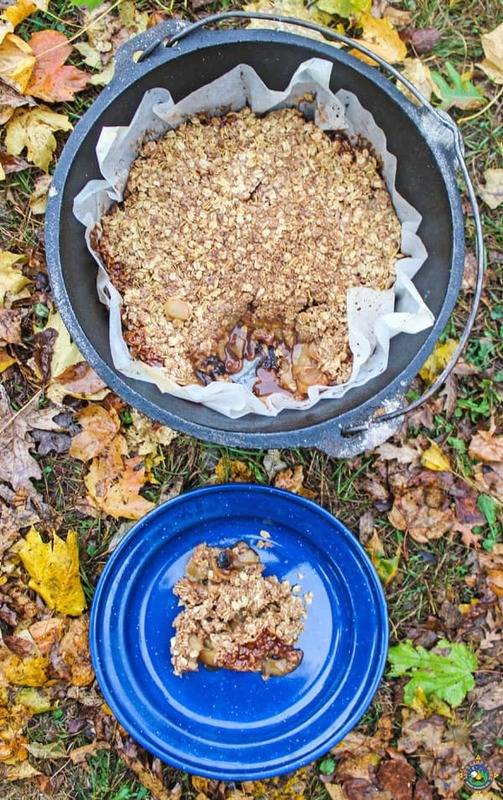 Create this delicious Apple Crumble in a Dutch oven while camping or at home. 8-10 Granny Smith apples plus 4 more of different variety- Gala, etc. Before prepping, start charcoal briquettes in a charcoal chimney. You'll need 8 for the bottom and 16 for the top, but add a few extra for backup. 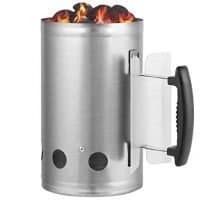 Preheat your Dutch oven over the fire. Line it with a Dutch oven liners. Peel and slice the apples. I used an apple peeler/corer/slicer device to speed up the process. Mix the sliced apples with the rest of apple mixture ingredients in a large bowl, stirring gently to keep apples from breaking. The topping can be made ahead and kept chilled until ready to use. I did this before the camping trip. Store in a covered container or a plastic zipper storage bag. In a food processor or with a pastry blender (which is easier while camping), cut flour and butter pieces together until crumbly. Add the rest of ingredients except for the oats. When all the ingredients are combined evenly, stir in the oats. Place apple mixture into the dutch oven and top with the crumbly mixture. You can sprinkle with some chopped nuts if desired. We use a foil baking pan that is the size of the bottom of the Dutch oven to contain the coals. Place the 8 coals in an even circular pattern and put the Dutch oven on top. Place lid on Dutch oven and put 16 coals on top around rim and middle of the lid. Allow 40- 45 minutes to bake. Rotate lid after 15 minutes one direction and Dutch oven, the other direction. Do this again in 15 more minutes. Check to see if bubbly and brown. You can leave it a few more minutes, but realize that the crumble will keep baking in a hot Dutch oven. Take the Dutch oven off of the bottom coals if getting too done on the bottom. Allow it to sit for at least 10 minutes with no coals. The more you open the Dutch oven, the longer it takes to bake. 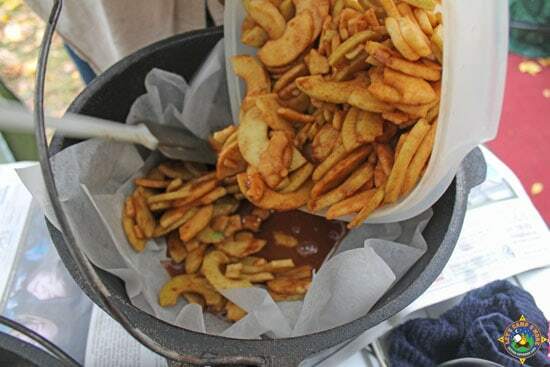 Apple Crumble would be awesome to enjoy on a camping trip! Thanks so much for sharing with us at Full Plate Thursday. Come to next weeks Thanksgiving party on Tuesday at 8:00 am, CST, see you then! 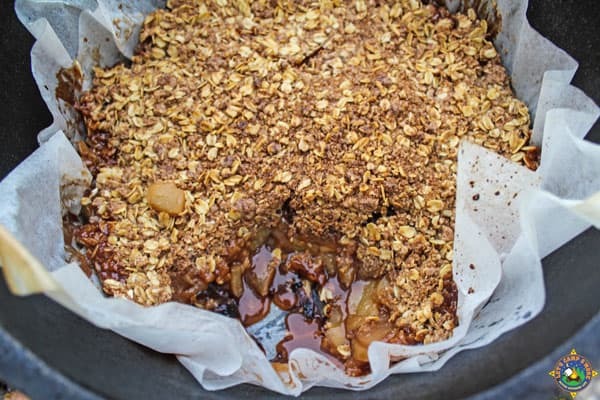 I just LOVE apple crisp and I know I would love it while camping! Thanks so much for sharing this amazing recipe with us at the Hello Fall Linky party. Pinned.